Momos are Tibetan dumplings popular in North India, Nepal, and other areas with large Tibetan communities. They can be filled with vegetables or meat, pan-fried or steamed, and are sometimes covered in a spicy tomato chutney. 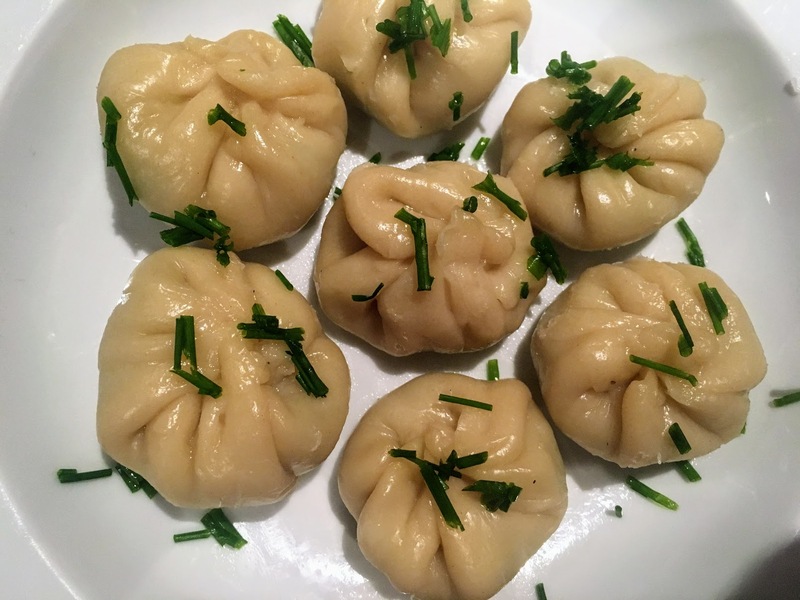 The other day, I tried an excellent steamed momo filled with chives at Little Tibet, a restaurant in New York, and wanted to create something similar at home. I’m also a big fan of potato momos, so after lightly adapting a dough recipe from the website Veg Recipes of India, I combined chives with potato, salt, and oil for a simple yet flavorful filling. Enjoy these dipped in tomato chutney or hot sauce. Prepare the dough: In a small mixing bowl, stir together flour and salt. With fingertips, rub oil into flour mixture. Add water, one tablespoon at a time, until a soft dough forms (you may need more or less water than the recipe calls for.) Knead until smooth and elastic. Cover and set aside for 30 minutes. Prepare the filling: Prepare chives, and set aside 1 tablespoon for sprinkling on top of the steamed momos. Poke holes in potatoes with a fork and microwave until soft, around 9 minutes total (make sure to turn potatoes over halfway, to ensure both sides cook evenly.) Remove peels and mash in a small mixing bowl. Stir in chives, salt, pepper, and olive oil until thoroughly combined and mixture is smooth. Shape and steam the momos: Divide the dough in half. Roll each half into a 5-6 inch log and cut into equal-sized pieces (about 4 or 5 pieces per log.) Flatten each piece, and roll into a thin, 2-3 inch circle. Drop 1-2 teaspoons of filling into the center of each circle. Gather the dough up around the filling, forming pleats, and twist dough at the top to seal. 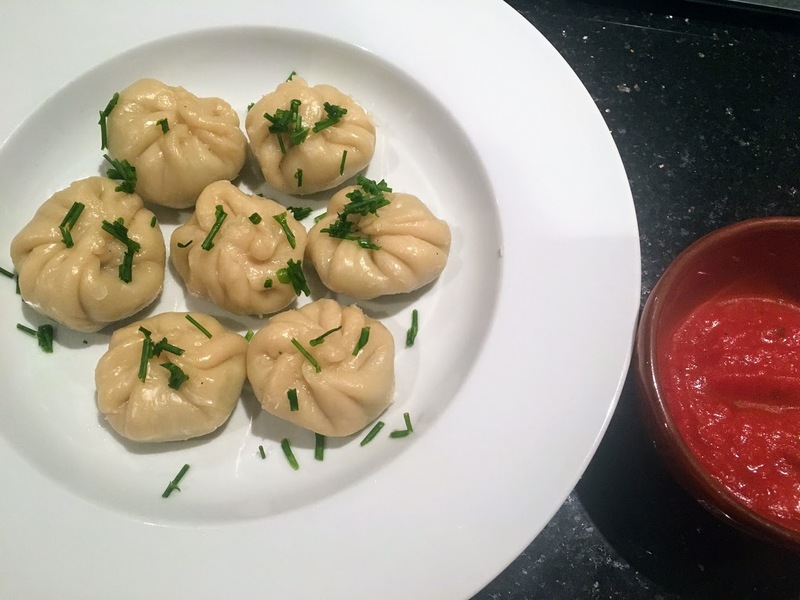 There will be leftover filling; refrigerate or freeze for the next time you make momos (you will probably want to make them again very soon!) Steam for 5-6 minutes, until dough is no longer sticky. Be careful not to overcook, or the dough will become tough and chewy. Sprinkle with reserved chives. Serve with Tibetan hot sauce or spicy tomato sauce. To store momos, refrigerate in an airtight container.